There was a running joke in college that I would only do the dishes if I had been drinking. I hate washing the dishes and apparently that was the only way it was tolerable. Now, I don’t have to do the dishes often because Mark and I have a deal worked out – if I cook, he’ll clean up. The problem is that he’s been working late a lot lately so I’ve been having to do both. Solution? One pan (or pot) meals. And lots of them. This was one of the best I tried – super easy and super flavorful. Tiny and I loved them! Coat a baking sheet with nonstick spray. 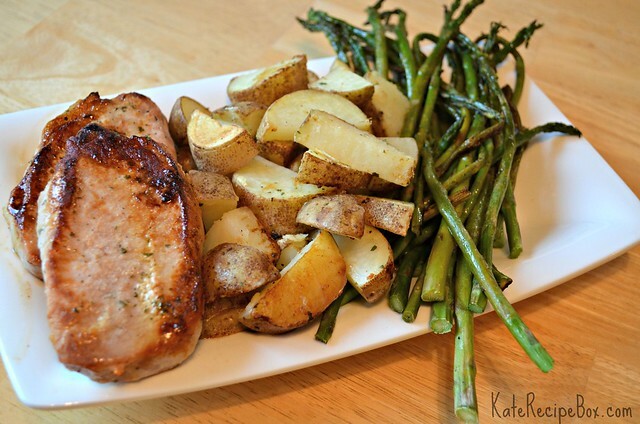 Add the pork chops, potatoes and green beans to the pan and drizzle with olive oil. Sprinkle with Ranch Seasoning and garlic; season with salt and pepper, to taste. Toss then shake into a single layer. Bake for about 20 minutes, until pork is cooked through and vegetables are soft. Serve immediately.